team meetings – Hayden Consulting – Where Your Success in Business and Life Matters! Loyal patients, isn’t that what we want? Loyal patients that return year after year, accept your treatment recommendations and refer their friends, family, neighbors and co-workers. They are loyal to your dental practice because they like and trust you. You’ve earned the privilege to serve them not just for a moment but for life. Is it really a privilege to serve them? Absolutely! Any office that struggles with getting and keeping new patients, struggles with getting patients to accept their treatment recommendations, struggles with the hygiene department’s continuing care reports and Swiss cheese-like appointment schedules, struggles to keep up with all the record transfer requests from patients and their new dental office, will learn (hopefully quickly) that having loyal patients in your practice is an earned privilege. The aforementioned struggles are greatly reduced or eliminated all together. Post-Op Calls – Call your patients in the evening to see how well they are doing. Call anyone that received anesthetic and new patients. Sending Cards – Keep Sympathy, Anniversary, Welcome, Congratulations, Thinking of you and Get Well cards on hand to send to your patients. As a team work together to be alert to opportunities to surprise your patients with a card. Do NOT let the caller go to voice mail during business hours (including lunch hours). People hate leaving messages. Oftentimes, they’ll hang up and call the next office on their list. Get the callers name and use it often. Find out how they heard about your office. “What type of insurance do you have?” shouldn’t be the first thing you ask. In fact, let the caller bring that part up. Your goal is to build a relationship with the caller, to get to know them and their expectations. Stay on Time – If you’re often running behind schedule, investigate as to why. If you know why, change whatever is causing you to stray from the schedule. Running behind schedule sends a message to your patients and your team that you don’t respect their time. Arriving to the office with plenty of time before the first scheduled patient, expecting your patients to arrive on time, never wait on hygiene exams, calculating the actual amount of time it takes to do procedures, controlling the schedules, these things will help you stay on time. Avoid working through lunch hours… everyone needs that time to recharge their batteries. Stay in Touch – Find ways to stay in touch with your patients via telephone calls, continuing care postcards/letters and on your social media sites. Keep your name in front of them. Deliver exceptional dental care – Give your patients the best care…always! With your team, celebrate with your patients their new & healthy smiles – (If a patient comes in for in office teeth whitening, let other team members know so they can compliment the patient on their smile. Let your patients see how much you and your team value the care you provide). Maintain a safe and clean office – Outside & Inside your office you want to send a positive message about your care by keeping your office very clean, well maintained and welcoming. See Improve your Office – First Impressions for tips and suggestions. Honesty – #1– Be honest with your patients regarding your fees and treatment. The quickest way to lose a patient is by them perceiving they’re being taken advantage of. Clearly explain the cost to do the treatment and the cost of doing nothing. Estimate as closely as possible the patient’s financial portion for treatment. Some will tell you that you should never quote fees over the phone…I strongly disagree. Why? You’ll lose many of your shopper callers by refusing to answer their request for a quote on a fee. They’re calling because they need/want a particular service. They’re ready! Make it easy for them to choose your office by honestly answering their question. Because you can not make an actual diagnosis over the phone, it’s impossible to know exactly what their cost will be, give a range of fees and offer for them to come in for a complimentary consultation. There are no short cuts, if your goal is to grow your practice with patients that are not merely satisfied but are delighted with your service and remain loyal to your practice, then you must remain loyal to your goals, your mission and your promise. Are you receiving my complimentary Practice Management and Marketing Ideas in your email inbox each month? If not, please subscribe today. Feel free to tell your dental friends all about us so they can start benefiting from these dental ideas too. 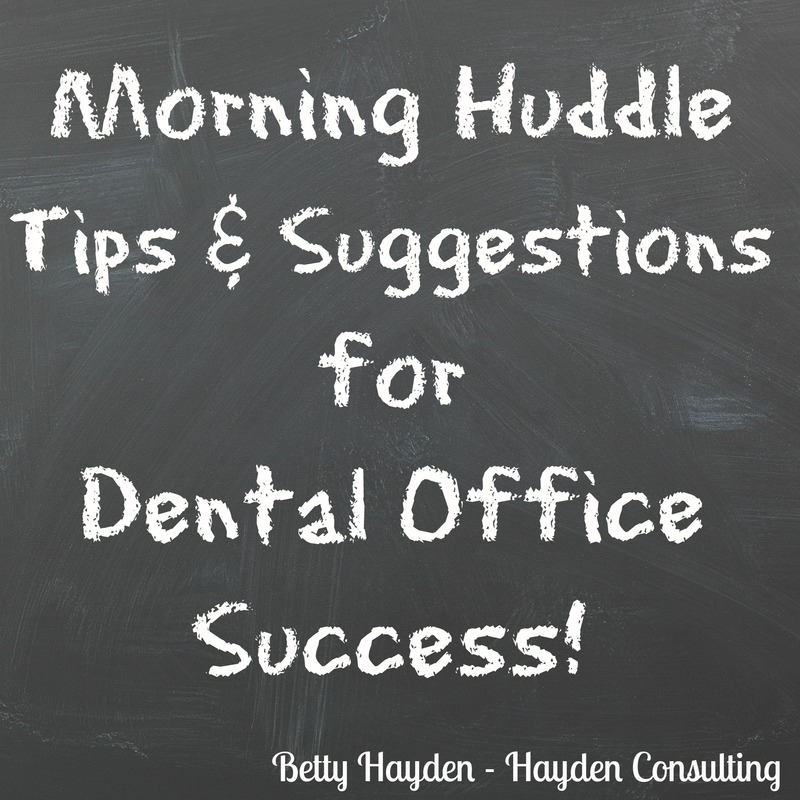 Note: For an updated morning huddle tips and ideas, please see Tips and Suggestions for the Best Morning Huddle Ever! If you feel the morning meetings are a waste of time or if you’re already conducting morning meetings and want to make them more effective, Please keep reading! Rotate team members to conduct the meeting and make certain that everyone stays on point and that the meeting ends and starts on time! Doctors (lead by example) be present at the start of the mtg and end each meeting on a positive note. Team members from each department can & should contribute what pertains to their particular department. Holes – Can a hygiene patient in need of restorative slide over into the doctors chair? Anyone coming in with the doctor that is due in hygiene? Social Media – Who will help with that today? Ask patients to like the office on Facebook, follow on Twitter & Instagram. So many reasons throughout the day to post to your social media sites, such as: a patient brings in a treat, to welcome a new patient to the office, a child joined your kids club/team, celebrate a beautiful cosmetic restoration/teeth whitening, etc. Positivity – End the meeting on a positive note. Tell a funny joke, read a positive quote and/or thank your team. This meeting sets the tone for the day… Make it a happy one! Let’s go change someone’s life or at the very least help them smile bigger and healthier! Come prepared! Have ready copies of the schedule (today and tomorrow). Charts/treatment should be reviewed the day prior to the huddle. Be sure to have available collection, scheduling and production goals for today and tomorrow and yesterday’s results. If you are not yet receiving my free dental marketing ideas every month to your email in box, please subscribe today. Feel free to share my blog with your dental friends. ~ Thank you!